Four of us met at Richmond Station and headed south crossing Bushy Park and then Littleworth Common, Ardbrook Common and Esher Common. The path was smoothed by fallen leaves and the views superb. After getting through Cobham we followed a bridlepath across the Mole (Which I misidentified as the Wey – Sorry) to Downside then a seriously quiet road (major hazard children on bikes ) to Bookham Common where another bridlepath led to Little Bookham and lunch. Returned via Oxshott ( where a cement lorry had recently had a go at demolishing the bridge ) Claygate and Kingston. Deterred from taking the twopath into Richmond as it was deeply underwater. 35 miles overall. 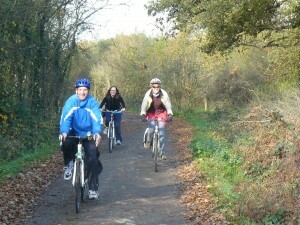 This entry was posted in Events, Ride Reports and tagged event, ride report by Paul Luton. Bookmark the permalink.